Perimenopause is the transitional time leading up to menopause, which occurs on average at 51.5 years of age. During this time, fluctuations in hormones can cause symptoms such as hot flashes, night sweats, difficulty concentrating, irritability and memory changes. Healthy lifestyle changes such as improving diet, becoming more active and not smoking can be challenging, but they can help with vasomotor symptoms. 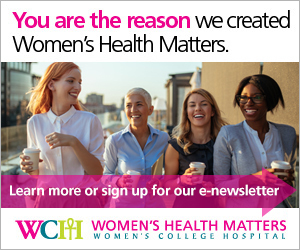 “For example, in perimenopausal women who are overweight, losing just 10 per cent of their body weight can also help decrease hot flashes,” Dr. Kirkham says. Smaller, more immediate changes that may help manage hot flashes include wearing layered clothing, carrying a fan, and using products such as cooling pillows. Vasomotor symptoms, along with other symptoms of menopause such as vaginal dryness, are caused by hormonal changes that occur as the ovaries decrease their production of the female hormones estrogen and progesterone. Hormone therapy (HT) to treat vasomotor symptoms usually consists of estrogen and progesterone. The progesterone decreases the risk of uterine cancer, which means it is left out when treating women who have had a hysterectomy (surgical removal of the uterus). Women who are only concerned about vaginal dryness can use estrogen alone – in the form of a vaginal cream, vaginal ring or vaginal tablet. However, this localized treatment may not help with hot flashes or night sweats. Estrogen and progesterone are the same female hormones used in birth control pills, but they are used in different doses and formulations when treating menopausal symptoms such as hot flashes. HT can be taken orally in pill form, but some newer formulations are delivered transdermally, which means through the skin. Transdermal options include wearing a patch, or using a gel that is rubbed into the arms. Some women may have concerns about potential risks associated with hormone therapy. However, recent research has shown that risks originally linked to HT apply mainly to specific groups of women, such as those who begin HT after age 60, and women who take hormone therapy for an extended period after menopause. HT is now usually prescribed in the lowest effective dose, for a limited period of time. It is very effective in treating moderate to severe hot flashes and night sweats, as well as vaginal dryness. Some women may find it helps improve their libido as well. HT is also associated with reduced risks of colorectal cancer and osteoporosis. Non-hormonal medications that may help with vasomotor symptoms include certain antidepressants. Studies have shown that certain SSRIs (selective serotonin reuptake inhibitors) and SNRIs (serotonin-norepinephrine reuptake inhibitors) can help reduce hot flashes. Like hormone therapy, these require a prescription from a doctor. Several herbal and complementary remedies are being studied as possible treatments for hot flashes and night sweats. These include black cohosh, flax seed and soy isoflavones, which are natural plant chemicals that mimic hormones. Some research has shown that these may help reduce hot flashes in some women, but they are not as effective as HT or antidepressants.